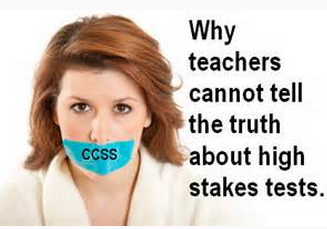 By now you have probably heard about the gag orders that the NYSED/Pearson contract requires teachers sign. The Education Department has said it wants to be able to use tests and test questions more than once in order to save money. Accordingly, they claim, teachers are forbidden to discuss the tests. In the spring of 2012, numerous errors were found in one of the tests designed by Pearson Education for NYSED which problems persisted into 2013 and 2014 testing seasons. Product placement was found and the quality of the test questions were seriously concerning to parents and teachers who felt a great deal of disapproval in being told that they were not permitted to discuss or examine the tests that children had been subjected to. Well, apparently NYSED must have missed the memo. According to Pearson’s CEO John Fallon, there is NO gag order and teachers are free to discuss their overrall opinions of the test. It would seem to me, that Fallon claims that excepting screenshots of the test and verbatim representations of the questions, teachers should feel free to discuss the tests with sufficient particularlity that it could actually help them do their own jobs? New York officials signed a $32 million five-year contract with Pearson PLC ‘s subsidiary, NCS Pearson Inc., in 2011 for its Common Core test merchandise. The contract expires December 2015. “What most people don’t know is that with the adoption of the Common Core State Standards Initiative (CCSSI), the New York State Education Department (NYSED) has instituted a provision to limit the speech of professional educators beyond what I think would normally be considered reasonable or necessary. I wonder if this has occurred in other states. These limitations are broad and indefinite, and govern educator conduct in and out of school. I am speaking of the “Exam Scoring Confidentiality Agreement” and directives to teachers articulated in the test-administration manuals. Teachers score portions of the exams, once they have been “calibrated” by Pearson/NYSED. This is a process whereby teachers are forced to evaluate student responses as Pearson/NYSED wish, resulting, according to some teachers, in more student failure. Note that school administrators indicate, in jest, that they must sign the form in blood (I assume they’re joking). To my knowledge, no such agreement existed when teachers constructed and graded Regents exams, as was the practice many years ago — an education past that few seem to know about. This earlier practice was before test development was contracted out to powerful for-profit publishing companies that have come to dominate education policy and practice. There are some fairly obvious problems with the Agreement. The first problem is that the language of the Agreement is overly broad. 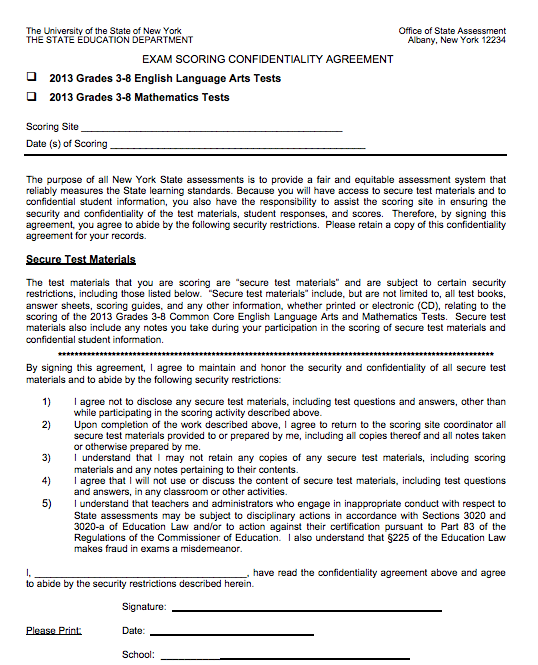 “I agree that I will not use or discuss the content of secure test materials, including test questions and answers, in any classroom or other activities.” For how long one must be silent? If a teacher discusses a test item at a Christmas party this coming December, is she in violation of the agreement? What happens if a student wants to discuss a test item a week after the test has been completed? The “Teacher’s Directions” manual says: “At no time may the contents of the test books be reviewed, discussed, or shared through any electronic means.” Of course the contents should not be shared during the week of testing. But the other restrictions are striking in their reach. And, by not being able to discuss the actual test and how students responded, teachers and the public are pressured to rely solely on official versions of what the tests results mean. This is a means for blocking knowledge of direct experience for both teachers and students and imposing the official interpretation of state authorities. You see the dilemma, dont you? Although touted as a measure to facilitate test integrity, the non-disclosure agreement effectively precludes teachers from actually examining the tests and drawing conclusions that could help their students learn nor are teachers given the chance to improve upon the quality of the test itself. Then, in stunning slap on the face, THOSE tests that they cannot see, speak about or discuss are used against them in evaluating teacher effectiveness. Does this system make any sense? No. Of course not. Pearson says that the state is responsible for the gag order, not it. Without debate as to the veracity of the clause, tshe proviso seems to cover actual test questions and precludes teachers from disclosing the same, but there is nothing in the agreement that precludes teachers from issuing their opinion about the tests which conclusion is validated by Pearson CEO Fallon as discussed above. Indeed, public funds paid for the Pearson contract so it is unlikely that if challenged the suppression order will withstand judicial scrutiny but it is concerning that one or both of the parties believed they could stifle free speech. Regardless, Pearson CEO specifically posits that there is no gag order and suggests that teachers are welcome to express their overrall opinions on the same. Teachers across the state of New York – be advised! 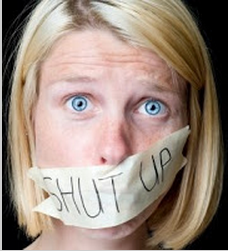 Straight from the Pearson CEO John Fallon – there is NO gag order. 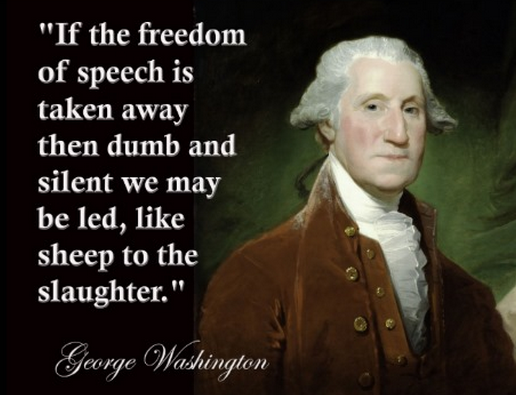 By all means, feel free to voice your opinions about the NYSED/Pearson common core tests! < Previous No PARCCing – Students and Parents Fight Back! I live in NJ and from what I understand in Union/Union County the teachers have been either gagged or scared to talk about or against Parcc…they are told to encourage kids to take it.. Please note that in the Adminisrator’s Manual for NYS assessments, it states that teachers can not even READ the test.